Rejecting the theory that Netaji had died in the air crash at Taihoku on August 18, 1945, Nag, who is ex-resident editor of The Times of India, Ahmedabad and Hyderabad, says, Bose was “probably kept alive because the Soviets wanted to use him for furthering Soviet interests in India if required.” The first edition of his book was released last year. 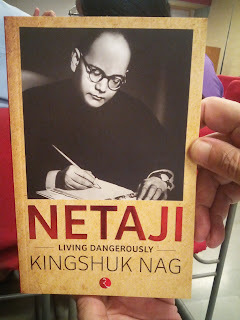 Answering a question during the book release ceremony, Nag admitted that Bose took the help of the fascists -- Germany, Japan and Italy -- "in order to free India". He disagreed with those who consider Bose a fascist agent, saying, "He was an Indian agent." Nag told the audience at the Ahmedabad Management Association that there was a need to "recognize" Bose's pivotal role in India's freedom movement, which Congress has long claimed its contribution. "India became free after the Indian soldiers, inspired by Bose, rebelled against the British", he said, adding, "After the 1857 rebellion this was the biggest such rebellion." The book was released by former Cabinet minister of Gujarat government Jay Narayan Vyas, who blamed Jawaharlal Nehru for "snooping" on Bose's family seeking to find the truth about Bose's death. Nag writes in the book that on being “freed” from gulag after his term was over, there seems much truth in the “the tale” that he was the sannyasi (monk), Gumnami Baba, the Indian leader in disguise, who lived in the Uttar Pradesh town of Faizabad, may have been Bose. According to Nag, Subhas Bose held “great hopes” from the Soviet Union, yet what may have made him suffer in gulag was a British machination. The British, he says, "planted doubts in the minds of the Soviets that Bose was a British agent." Admitting that "the Soviets were not foolish enough to fall for this bait", Nag, however, says, "Yet, this attempt was a subtle one, enough to create apprehensions in the minds of the Soviets.”. Declassification of all Netaji files may prove that JAP AND BRIT JOINTLY PLAYED A FOUL GAME WITH NET@JI; In WW-I, J@pan was a Briti$ ally. Before WW-II, Jap-US trade war and political war started; this led to actual US-JAP war. So Briti$ became an enemy to J@pan by diplomatic manipulation as US-Briti$ alliance was there. After WW-II, J@pan revived their old link with Briti$. Jap and Brit spies were well linked before WW-II. JAP SPIES AGREED TO ELIMINATE NET@JI. Motive was to appease Brit and purchase security for Jap royal family. So, J@PAN HANDED OVER NET@JI TO BRITI$ AND BRITI$ EXECUTED HIM IN SECRETE. False news of air crash was Jap fabrication. In any controversial case, liar is to be suspected. Net@ji plan to start second independence war with USSR help was known to J@pan. So, Brit and Jap spies developed a common minimum program against pro-SOCIALIST agenda of Net@ji. Why should Jap imperialism agree to patronize emergence of independent India as a permanent communist ally? Is it not more logical to fulfill Briti$ condition and purchase favor? Why Jap royal family was not tried as a war criminal? What is the mystery behind this favor? There is another point about gumnami baba. Who was he? He was a dummy created as a part of common minimum program of Jap and Brit imperialism. In axis camp, creation of dummy by plastic surgery was a common practice. Hitler and Mussolini were having number of dummies. J@pan sold Net@ji-dummy to Briti$. Briti$ deputed this dummy at faizabad of UP, with a purpose to create confusion regarding Net@ji. This confusion prevented nation to be doubtful about role of Jap or Brit. So, gumnami baba of faizabad is a common creation of Jap and Brit spies. Never had he told truth. If he had told anything, that must be lie. In a controversial case, liar is to be suspected. So, J@PAN SOLD NET@JI TO BRITI$ AND BRITI$ EXECUTED HIM IN SECRET. J@pan sold Net@ji-dummy to Briti$ and Briti$ deputed him at faizabad of UP. J@PAN SURRENDERED TO US-UK SIDE ON 15-AUG-1945. Net@ji’s last flight was on 18-aug-1945. A SURRENDERED J@PAN WAS NO LONGER AN ALLY OF AZAD HIND. They worked as per their new mentors, the Briti$. I have come across a few remarks of Asit Guin on Netaji Bose. These remarks appeared to be prejudiced and never rooted to the ground reality. Leela Roy who knew Netaji Bose more intimately than many of the Bose family members could not write to Dilip Roy if she had any doubt that his friend is alive and in India. A dummy cannot hide himself to a devoted patriot like Leela Roy. Will Guin tell under whose guidance he is misleading the people? Justice Mukherjee himself took him as Netaji but he failed that DNA reports from Calcutta did not match. But West Bengal was then under the rule of CPIM who were dead against Netaji. British ordered assassination of Netaji: New facts are coming out that British ordered assassination of Netaji after he escaped from house arrest in 1941. Eunan O-Halpin of Trinity College, Dublin, made the stunning revelation while delivering lecture at Netaji Research Bureau. A history professor, O-Halpin said the plan of British Special Operation Executive to assassinate Bose, on his way to Germany was foiled as he changed his route and went via Russia. O-Halpin had handed over the classified documents to Krishna Bose. Sugato Bose, a professor of history in the Harvard University, said he had already informed PM Manmohan Singh about the matter. “I met PM on July 26 and informed him of the existence of documents and told him that unveiling these documents would not affect bilateral ties with UK.” said Bose. But who really killed Netaji? Netaji had unified Hindus and Muslims in INA that drove British Army to its knees and came up to Imphal and raised India flags. The Taiwan plane crash was the biggest cover up. It is reasonable to suspect that BRITISH WERE BEHIND KILLING NETAJI. British were eager to get rid of Netaji because with Netaji presence they could not have split India. British ruled India with the policy of divide and rule. Netaji did not like that unlike other Indian leaders like Nehru or Gandhi. Some say, Netaji was handed over to Russians by the Japanese and Stalin ordered his execution. But now British archives are making it clear that BRITISH MAY HAVE EXECUTED HIM IN SECRET. THIS WAS AN ACT OF ANGLO-JAPAN SECRETE PACT. Japan surrendered to Brit & US on 15th Aug, 1945 and last air trip of Netaji was 3 days after, on 18th Aug 1945. So a surrendered Japan was no longer azad hind ally, as because Netaji was not in a mood to surrender and BRITISH REVIVED THEIR OLD PLAN TO ASSASSINATE BOSE. British gained a lot from his disappearance. They could split India into India and Pak. It was a lesson taught to Indians by British before they dilute their empire. There lies the motive for killing Netaji. O--Halpin said the British thought Netaji would travel to Germany from Afghanistan via Iran, Iraq and Turkey and informed representatives in Istanbul and Cairo to carry out the operation. Still British are not competent enough to tell the truth. It is reasonable to believe that JAPAN SOLD NETAJI TO BRITISH AND BRITISH EXECUTED HIM IN SECRET. ACCORDINGLY BOTH JAPAN AND BRITISH ARE HIDING TRUTH AND SPEAKING LIES ON NETAJI. there were two netajis in AZAD HIND FAUZ . Netaji Subhash Chandra Basu and Netaji Gumnami Baba . Netaji Subhas Chandra basu was sold by surrendered Japan to mentor British and British killed him in secrete Netaji Gumnami baba was also sold by japan to British and British deputed him in faizabad . Azad hind government was then 1942 recoqnise by japan and more countrys in world .when we see the old films of Netaji we observe the guard of honor given to Netaji .when japan lost the war Netaji by the help of his intelligence officer who plan Netajis Escape from Japan which was follen in the hands of britishers.Because Netajis help n ideas the Royal family was save from British war crimes sentences.As per the real fact The Gumnami Baba was Netaji Subhash chandra Bose.in 1985 on funeral of Gumnami Baba all INA top officer were came n there was security . This is the fact that Indian top buraucrates new the Babas reality.on Natajis birthday Indian Govn always send presents to Baba.because of Indira gandhis secret covenant that he will not come out from disguise she supported baba.under her guidence he was baba was safe.Jaihind.